A pulmonary infarction, also called lung infarction, occurs when a section of lung tissue dies because its blood supply has become blocked. While several medical conditions can cause a pulmonary infarction, the most common cause is pulmonary embolus. Depending on its size and location, the symptoms of a pulmonary infarction can be anywhere between quite mild to extremely severe. 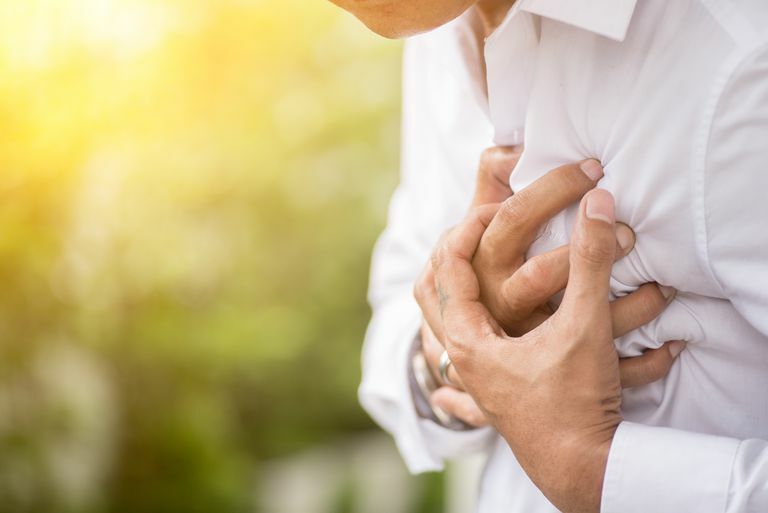 However, whatever its symptoms, a pulmonary infarction always indicates the presence of a serious underlying medical problem, and always requires aggressive evaluation and treatment. The symptoms of a pulmonary infarction can be quite variable and are related to the size of the infarction and its location within the lungs. Larger pulmonary infarctions usually produce more severe symptoms, as do infarctions that affect the pleura (the fibrous membranes that protect and cover the lungs). In most cases a pulmonary infarction is caused by a blood clot that is relatively small, producing a fairly small infarction. In these cases, symptoms caused by the infarction itself may be very mild or nonexistent. Most of these symptoms are often seen with a pulmonary embolus, whether or not it has produced a pulmonary infarction. However, when a pulmonary embolus is accompanied by either hemoptysis or chest pain, that’s a tip-off that a pulmonary infarction has also occurred. While small pulmonary infarctions usually have no long-term consequences, large infarctions can cause chronic symptoms, and can even become fatal. By far, the most common cause of pulmonary infarction is a pulmonary embolus. It is now estimated that up to 30% of pulmonary emboli produce pulmonary infarctions. Several other medical conditions can also cause a pulmonary infarction by producing occlusion of part of the pulmonary circulation. These include cancer, autoimmune diseases such as lupus, various infections, sickle cell disease, infiltrative lung diseases such as amyloidosis, or embolization of air or other materials from an intravenous catheter. Intravenous drug abusers are particularly prone to develop pulmonary infarctions. Whatever the cause, very large pulmonary infarctions are relatively uncommon, because lung tissue has three potential sources for oxygen: the pulmonary artery, the bronchial artery (arteries that supply the bronchial tree), and the alveoli themselves (the air sacs within the lungs). This means that life-threatening pulmonary infarctions are most commonly seen in people who have significant underlying medical problems, such as chronic obstructive pulmonary disease or chronic heart failure. Notably, smokers also have a much higher risk of pulmonary infarctions. In the large majority of cases, a pulmonary infarction is diagnosed as an additional finding when looking for a pulmonary embolus. In a person who is diagnosed (or suspected of having) a pulmonary embolus, a doctor will also be suspicious of a pulmonary infarction if the patient is experiencing hemoptysis or chest pain, or if the physical exam shows evidence of a very large embolus (in particular, if tachycardia, rapid breathing, or excessive sweating are present). In addition, a pulmonary infarction that affects the pleural lining of the lungs may produce a distinctive “pleural rubbing” sound that is audible with a stethoscope, a sound that resembles rubbing two pieces of leather together. In the absence of such clinical findings, a small pulmonary infarction may escape detection altogether. However, now that pulmonary CT scans are being more routinely used in the diagnosis of pulmonary embolus, even small pulmonary infarctions are detectable if they are specifically looked for. The treatment of pulmonary infarction includes supportive care and the management of the underlying condition that has caused the infarction. Supportive care includes maintaining adequate blood oxygenation by administering oxygen and controlling pain to make breathing more comfortable. If adequate blood oxygen cannot be maintained by delivering oxygen by nasal cannula or face mask, the patient may need to be intubated and placed on a ventilator. Other treatments depend on the suspected underlying cause. Aggressive treatment must be instituted for sickle cell crisis or infection if those causes seem likely. Treatment should be stepped up (if possible) for any autoimmune disease that has caused the problem, and treatment options need to be reassessed if cancer is the cause. However, in the large majority of cases, pulmonary infarction is caused by a pulmonary embolus. The treatment of pulmonary embolus includes, in addition to supportive care, the institution of anticoagulant medication, usually with intravenous heparin, followed in a few days by an oral anticoagulant. In cases where the pulmonary embolus is massive and appears to be producing a large pulmonary infarction, or especially if blood flow to the lungs is so compromised that the cardiac output is dropping, it may be necessary to administer fibrinolytic (“clot-busting”) drugs to attempt to dissolve the clot that is obstructing blood flow. The extra risk involved in using such drugs, in these circumstances, is outweighed by the acute risk of death if the clot remains where it is. Pulmonary infarction — death of a section of lung tissue caused by vascular obstruction — is a fairly common consequence of a pulmonary embolus. Other causes of pulmonary infarction are far less common. In most cases, a pulmonary infarction is relatively small and has no real long-lasting consequences, as long as the underlying cause is adequately addressed. However, a larger pulmonary infarction can produce significant acute symptoms and long-term problems. In all cases, a pulmonary infarction requires aggressive medical evaluation and treatment. Parambil JG, Savic CD, Tazelaar HD, et al. Causes and Presenting Features of Pulmonary Infarctions in 43 Cases Identified By Surgical Lung Biopsy. Chest 2005 Apr;127(4):1178-83. Kucher N, Goldhaber SZ. Management of Massive Pulmonary Embolism. Circulation 2005; 112:e28. Kabrhel C, Jaff MR, Channick RN, et al. A Multidisciplinary Pulmonary Embolism Response Team. Chest 2013; 144:1738. Massimo M, Matteo B, Cesario C, et al. Predictors of Pulmonary Infarction. Medicine (Baltimore). 2015 Oct; 94(41): e1488. doi: 10.1097/MD.0000000000001488.